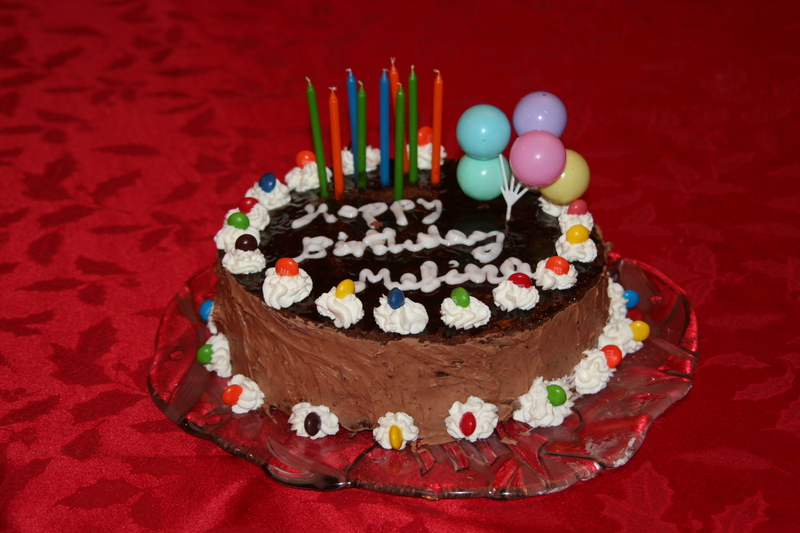 For her birthday my shiny angel chose a chocolate brownie cake by Emeril Lagasse. I think it was a good cake and we enjoyed it a lot, especially the birthday girl. I think there’s room for corrections. The icing was a bit too sweet for my taste and the cake itself needed more to resemble a brownie. A good basic recipe nonetheless. I added chocolate syrup on top, instead of covering with icing. My daughter decorated her cake beautifully. She dreamed of a cake with m&ms and she made one. Happy birthday, my Melina. I love you so very much. How to make the cake: In a mixer, beat the butter and sugar for about 5 minutes or until creamy. Add the eggs and beat some more. In another bowl, mix the dry ingredients (flour, cocoa, soda) and add them to the butter mix gradually, alternating them with the liquid ingredients (buttermilk, sour cream, vanilla extract). Beat at low speed until it’s all well mixed. Divide the mix in two cake pans and bake them at 350F/180C for about half an hour or until a toothpick comes out clean. I used silicone pans (see photo below) . If you use regular pans, don’t forget to oil the pans or line them with parchment paper. How to make the frosting: Beat the butter, cream cheese, and cocoa at low speed until well combined. Add the sugar, buttermilk, and vanilla and beat at high speed until cream. How to put it together: When the cakes have cooled entirely, remove them from the pans. Place the first layer on your serving dish. Add a layer of frosting. 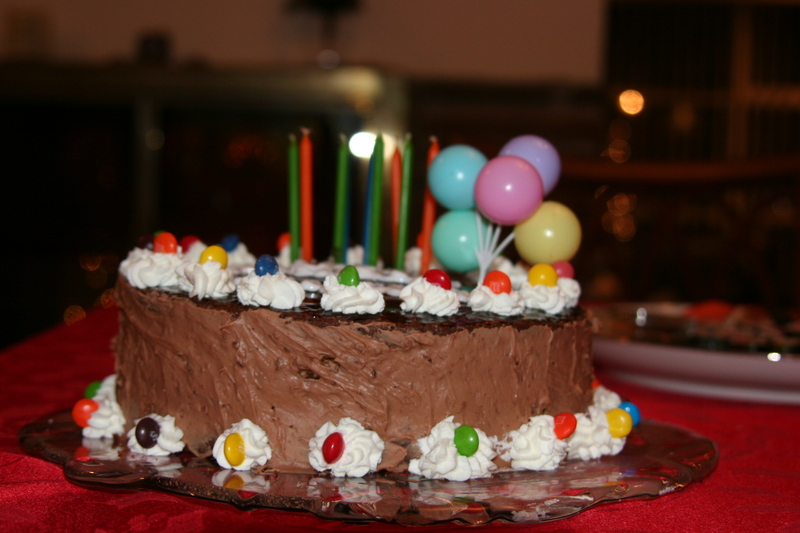 Put the second layer on top and then be creative with decorations. As you can see in the photos, I covered the sides only with frosting, the top with chocolate syrup and beat some chantilly to make holders for the m&ms. How to make the chantilly (optional): Beat a cup COLD heavy cream until it starts forming peaks. Add four tablespoons confectioner’s sugar and a teaspoon of vanilla extract. Beat a bit more but do not overdo it at this point. Just enough to get the sugar an vanilla mixed in. 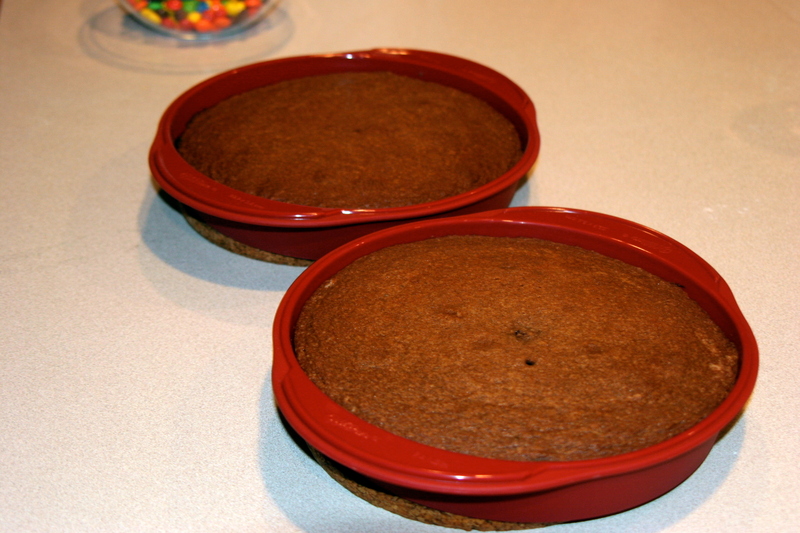 Tips and notes: The silicone pans are great and make it very easy to get the cake layers out. Definitely worth getting them. Last year, I invested in a box of utensils (Wilton Cookie Pro) for dispensing batter (and chantilly) and I don’t regret it a bit. By far the best dispenser, does a great job dispensing, cleans easily and lasts for ever. In the photo, you see the cookie dispenser discs but the box comes with parts for dispensing chantilly florets.